I beg to introduce myself to you as a clerk in the Accounts Department of the Port Trust Office at Madras on a salary of only £20 per annum. I am now about 23 years of age. 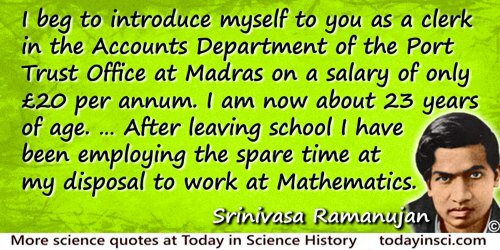 … After leaving school I have been employing the spare time at my disposal to work at Mathematics.